Working for over 10 years as a school psychologist, I have had a lot of opportunities to observe students with autism in the classroom. One thing that I consistently noticed, particularly for kids who struggled to communicate verbally, was an excellent ability to complete hands-on, interactive tasks with a clear visual ending and a reduced amount of visual clutter. Something I also noticed however, was that when staff tried to explain these tasks verbally or used a lot of verbal prompting during the task, the students often looked around, stood up, walked away, etc. 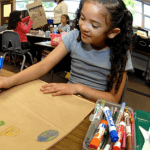 However, when the task was demonstrated and prompts were gestural rather than verbal, students participated more readily and often learned how to complete the tasks themselves. 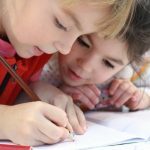 Research supports the theory that building visual structure into tasks is an effective approach to addressing the unique learning styles of students with autism. 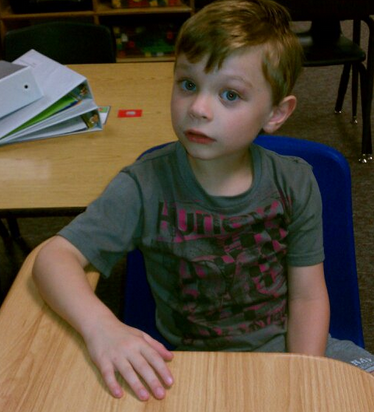 To read more about this research see Learning Through Seeing and Doing-Visual Supports for Children with Autism. A perfect example of this type of interactive, visually-structured task is file folder games. File folder games are often seen in manila file folders, hence the name; but you can easily use regular paper to make “file folder” games. File folder games can be purchased or downloaded. You can also make them yourself, which I describe in more detail below. 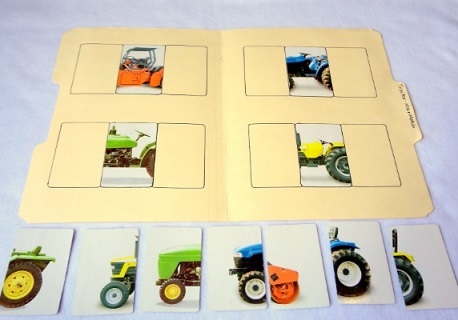 In this first example, the student must put the pieces together to make a total of four tractors. In this task the student practices problem solving, reasoning, and sequencing skills, while also learning the vehicles are different in some ways and the same in others. 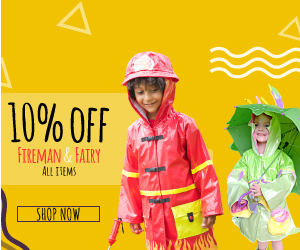 Colors and counting can also be incorporated into this task. Bring this activity to life by showing the student real tractors or a tractor video. Side-Note: In my observations, when verbal explanations were used, they were most helpful when they were brief (one to two words) and to the point. An example of this would be pointing to each tractor, while simultaneously saying it’s color, after the student puts the pictures together. 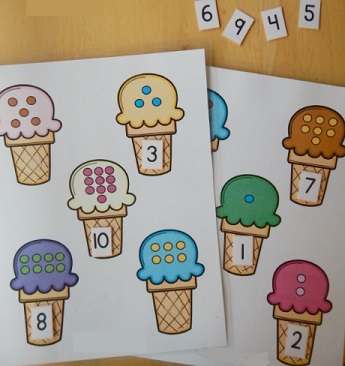 In this second example of a file folder game, the purpose of the task is to practice counting and number recognition. Each number goes on the cone with the corresponding number of dots. Again, you can turn this into a real life activity. 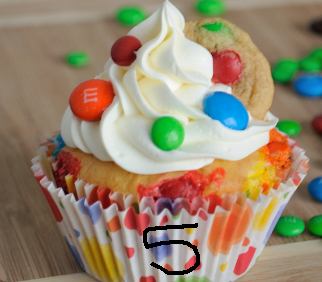 For instance, you could make cupcakes, draw numbers on the wrappers and ask your student/child to put toppings on to match the numbers on the wrapper such as five M&M’s on the number 5 cupcake. If you make the cupcakes yourself, allow the child to participate as much as possible in the baking process, another practical activity that includes hands-on learning, visual input, and a clear beginning and ending. Something else I love about file folder games is that you can even use them to teach more difficult or abstract concepts. For instance, you can teach fractions by having a student match a visual representation to a number representation. In the example below, you could cut out the numbers and teach the student to place each number over its corresponding picture. Again, you can use it to create a real-life example. Maybe something with pie or pizza. 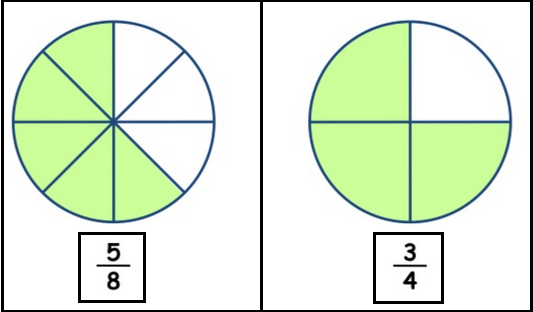 For example, have the student share or serve a fraction of the pie. 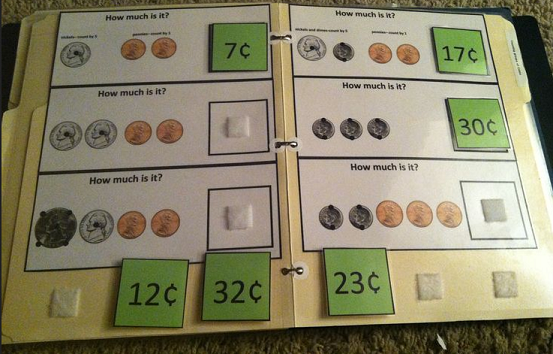 File folder games can be used to teach all subjects and a variety of concepts. It really is limitless and so many children I know, including my own two year old son, love to engage in these types of closed-ended, visual, interactive activities. A lot of apps now are starting to incorporate these concepts. Where as with real file folders games the pieces are movable, in an app the child drags the pieces to the correct location. Both allow the student to interact in the activity and manipulate the pieces. ABCmouse.com is a great example of an app that allows for this type of visual interactive learning, specifically the puzzle section of the app. 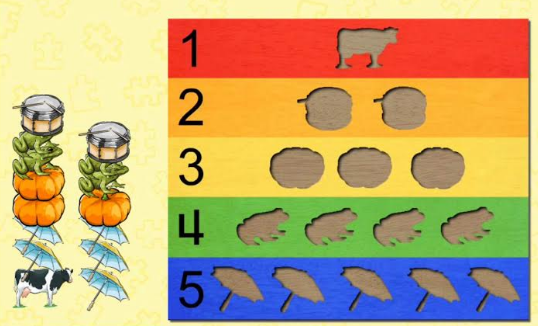 Below is a sample of an ABCmouse.com puzzle that teaches about counting. 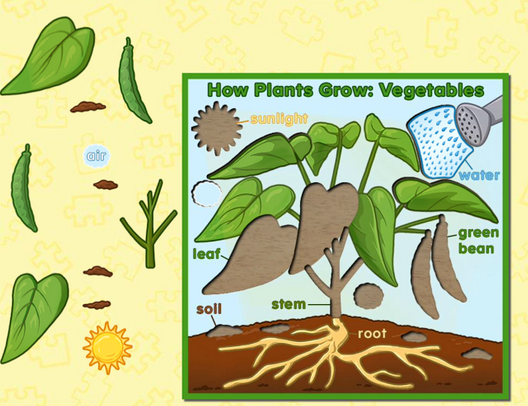 Here is another ABCmouse.com puzzle that teaches about the structure of a plant. The child has to drag the plant parts into their correct locations. I love how the student needs to focus on the small details in order to make the whole picture. And again, both the counting activity and plant activity could easily be turned in to a real life experience. Here are some examples of file folder games that I made myself at home on Microsoft Word. These are downloadable and free to use. 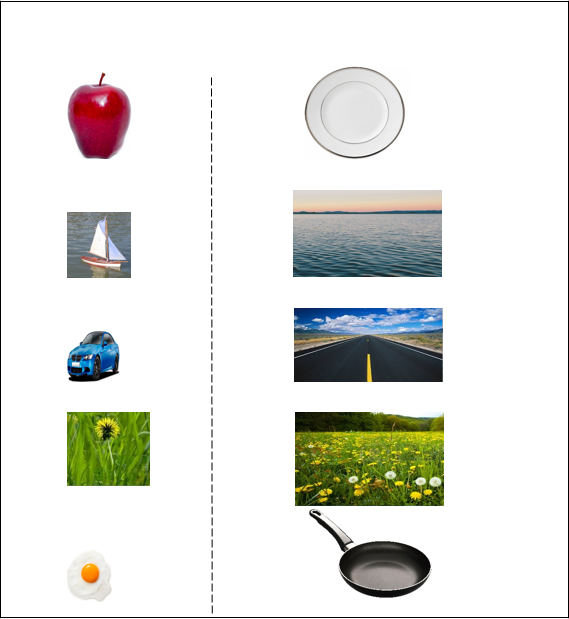 The first is a reading activity (match the word to the correct picture). 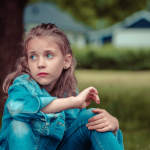 There are some students, particularly those with language difficulties, that struggle to learn phonics and phonemic awareness (letter sound correspondence/segmenting and blending sounds). Another approach to teaching reading to students who struggle to learn phonics is through memorization of word forms (knowing how the word looks). 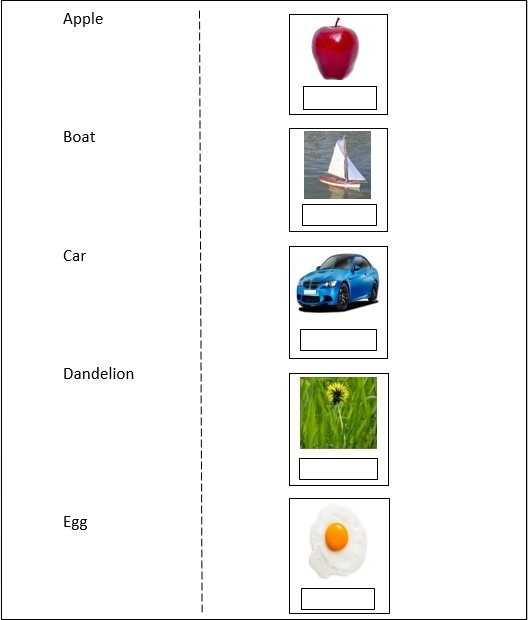 So the purpose of this activity is to help students remember how the word looks and what concept it represents. Just like with all file folder games, this is something that can be practiced again and again until the student has all the answers correct. In this next task, the student has to match the image on the left to the one it belongs with on the right. 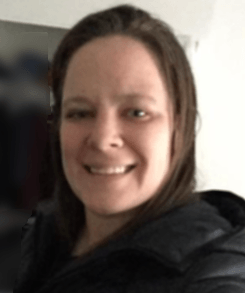 This task helps students connect concepts and make sense of information. You can do a search on Google for Free File Folder Games and a variety of sites that offer printable activities will come up. You can also purchase pre-made file folder games that are already laminated. 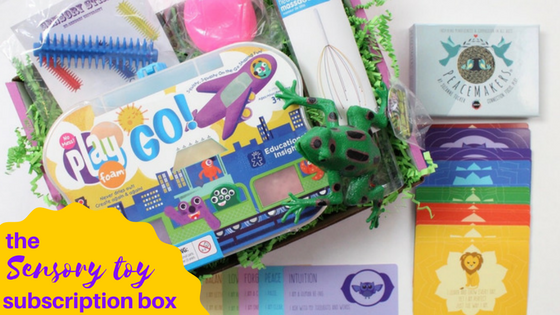 For example Carson-Dellosa Publishing, a popular provider of educational products, has dozens of file folder games ready to go, encompassing a variety of concepts related to reading, math, science, and more. If you would like to laminate your own products, an office supply store like Staples provides laminating services. You can also purchase your own laminator. They are fairly inexpensive.